Gravity Forms User Registration Add-on Support: Users Insights automatically detects the custom user meta fields and makes these fields available in the user table and filters. General Gravity Forms Support: Provides the tools to filter the WordPress users based on the forms submitted. 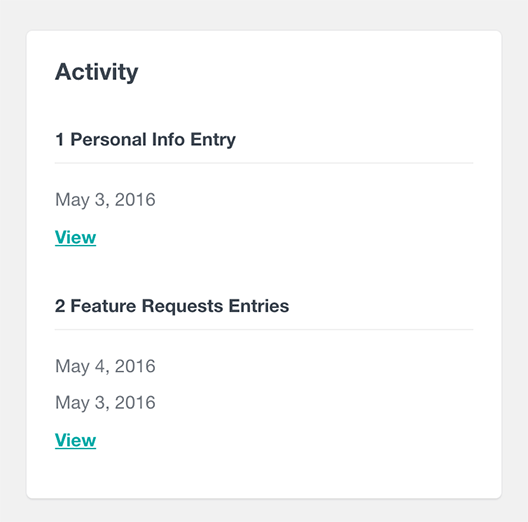 Also lists the submitted form entries for each user in the user profile section. With the Gravity Forms User Registration Add-on you can create custom forms that can be used as user registration or user update forms. The user registration/update form can contain various fields – you can choose from all the available Gravity Forms fields. 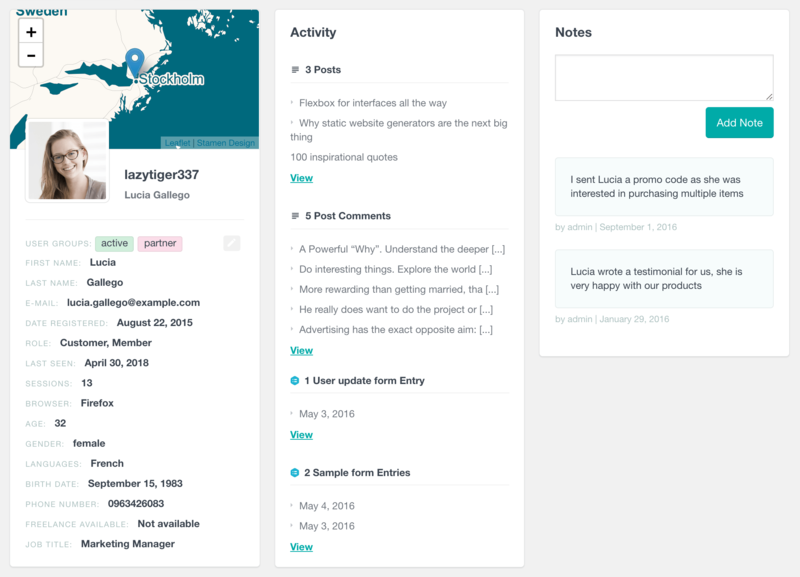 The Gravity Forms module of Users Insights lists all the Gravity Forms user data on the user table and makes it available in the user filters. Users Insights detects all the registered custom user fields and since there are different types of fields available, it also makes sure to provide the corresponding filtering options for each field. The drop down and radio button fields allow the users to select one option from a predefined set of options. For this type of fields, Users Insights automatically detects the available options and makes them available in the filters. In this way, when filtering the users by those fields, you can just choose from the list of available options instead of having to remember the exact names of the options. The Checkboxes and Multi-Select fields allow the users to select one more options from a predefined set of options. The List field allows the user to add a list of one or more items. The common between these three field types is that they can store one or more options per field. Users Insights also supports the Date field type, which means that when a Gravity Form user date field is detected and added to the table, you can sort the users based on this field in a chronological order. You can also apply various date filters based on those fields to narrow down your user selection. The values stored in the date fields are listed in the user table in a user friendly format – this is the format that you have chosen as standard date format for your WordPress install. 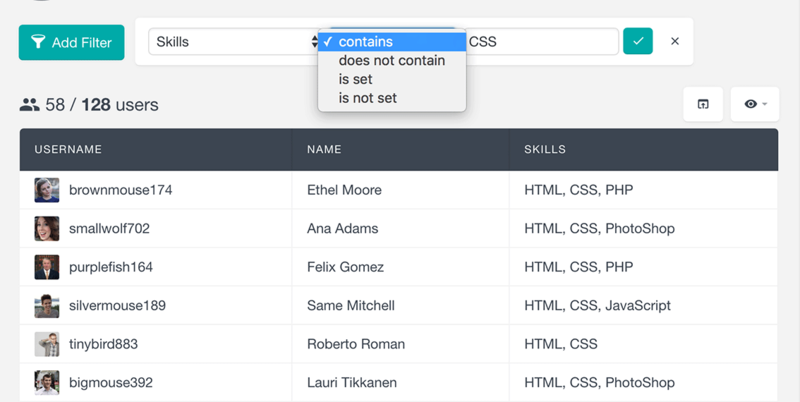 The rest of the Gravity Form field types, such as Text, E-mail or Phone fields are detected as text fields. The values of these fields are listed just in the format in which they are saved and you can sort the user table based on any of these fields in an alphabetical order. You can also apply various text search operators, such as “contains” or “starts with” to find all the users that fulfill a certain criteria. The user profile section of Users Insights is the single place that collects all the available user data from different modules, plugins and elements, neatly organised to give you insights about each user’s data and activity. 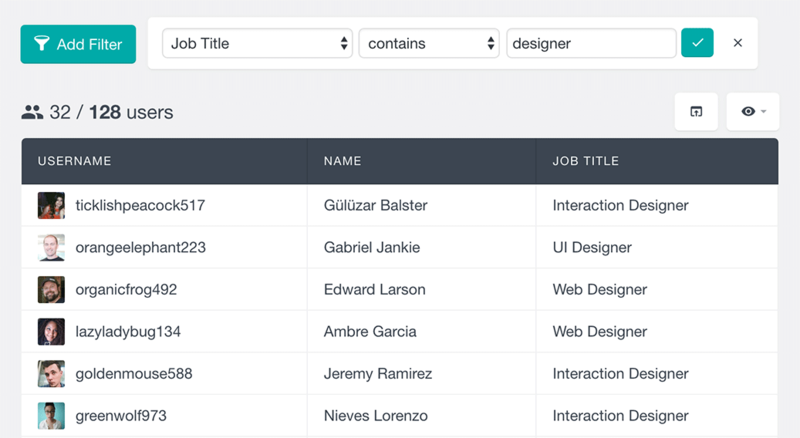 Besides the Users Insights user table, all of the custom user fields registered with the Gravity Forms User Registration Add-on, are also available in the Users Insights user profile section. This makes it easy for you to review all of the stored Gravity Forms user data, as well as view the additional user data, such as the user location or user activity. If you have Gravity Forms forms that are submitted by your WordPress users, you might also want to have an insight on how they interact with the forms. The Gravity Forms module of Users Insights can give you the information about who has or hasn’t completed a certain form and also can provide you a detailed list with the form submissions for each WordPress user. Once the Gravity Forms module of Users Insights is activated, it will automatically add two additional filters to the Users Insights filters section – “Has completed form” and “Has not completed form”. As their names suggest, when using the “Has completed form” form filter, you can list all the WordPress users that have completed a certain Gravity Form. On the other hand, the “Has not completed” form filter lists all the WordPress users that haven’t completed a particular form. Both filters give you the options to choose from one of the existing forms. Here is an example where we have filtered the WordPress user list, showing only the ones who have completed our “Feature Requests” form. In the same way you can also use the “Has not completed form” filter to find all the users who haven’t completed a particular form. In this way, if for example you have a form that is very important to be completed by all users, you can find all the users that haven’t submitted this form and export their e-mails in a CSV format by using the Users Insights export feature. Then you can use your favourite e-mail marketing tool to import the users (if it supports CSV import) and send emails to those users to remind them about the form. In addition to the form filters, you can also see a detailed list of all form submissions for each user in the Users Insights user profile section. The submissions are listed separately for each form – the list includes the most recent submissions with a link to the Gravity Forms page where you can review the full list of submissions for the user. Each entry is represented by the date it was submitted and also includes a link to the detailed Gravity Forms entry page. Users Insights provides many additional features – from various 3rd party plugins support to custom Users Insights specific features, that help you better organise and manage your WordPress users. The plugin is modular, which means that all the main features are available as separate modules, which can be optionally enabled or disabled. 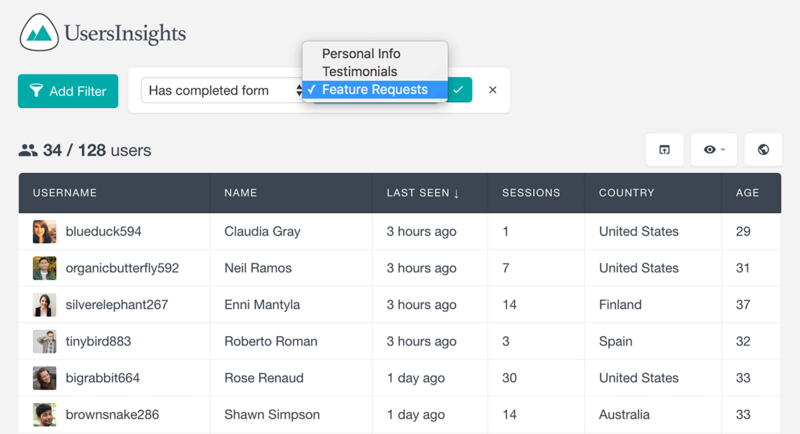 Moreover, you can customise the Users Insights user table, so it shows only the user fields that you need and in the order that you specify. When using the Gravity Forms module of Users Insights, you are not limited to the features that this module provides – you can use the Gravity Forms features in a combination with all the existing Users Insights modules and features. For example, you can use the Geolocation feature to find out more about your users’ locations. Or you could use the Groups feature to create custom user groups and assign them to your users. Additionally, if you are using any of the supported 3-rd party plugins, such as WooCommerce or Ultimate Member, you can combine the data that they generate with your Gravity Forms user data and use all the available user filters. Another useful feature of Users Insights that you can use in combination with the Gravity Forms module is the Export feature. 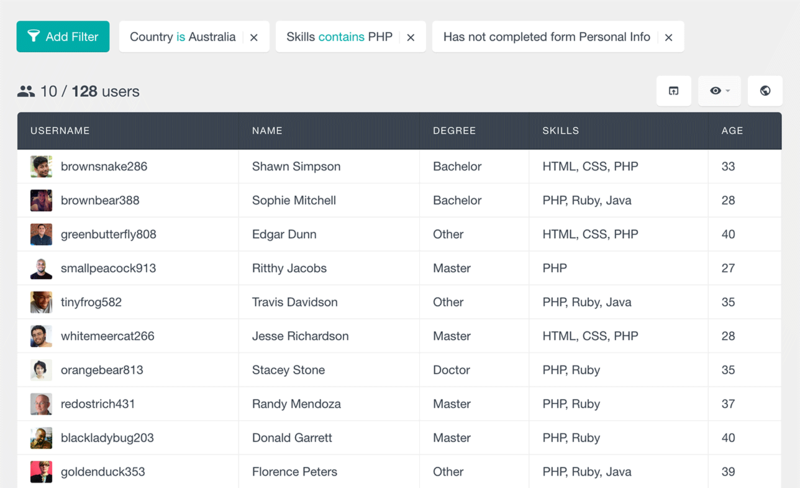 The Export feature lets you create a customised user data export in a CSV format. With this feature you can export the data just in the way it is presented on WordPress user the table, including all of the applied filters, visible columns and sorting options. This feature can be very useful to export a customised user list to your favourite email marketing tool (such as export to Mailchimp), build custom reports or just to have it for a future reference. If you need to analyze your Gravity Forms user data further, you can also use the Gravity Forms Reports feature. The reports create various charts to visualize the user data submitted with the User Registration add-on. Whether you use the Gravity Forms User Registration Add-on to register and save custom user data, or just the Gravity Forms plugin by itself, if you have registered WordPress users that interact with these forms, you will always need a way to manage this data so you can know more about the WordPress user activity on your site. Users Insights can give you the tools to analyze, search and filter your user data and their related Gravity Forms activity.